Looking at the materials section of Paul Turner’s English classes you see multiple assignments and student submissions. Most of these submissions are not final drafts but pre-writing, first draft, second draft, then finally followed by a final draft. As a Tech Mentor of the Middle School English Department at UWCSEA Paul looks for pods and processes to experiment with, find value in and implement throughout the teaching and learning process. He advocates ‘getting everything on the platform, documenting the writing and reading processes and making the evolution of a piece of writing visible’. The MS English Department is using the assignments feature of the Online Learning Platform (OLP) to collect multiple submissions on a single piece of writing, from photos of brainstorming or graphic organising in the student’s notebooks through to a final draft. As each of these is collected and collated on the platform, different rubrics and conferencing sessions are applied and attached to each stage of the process. So as students proceed through the writing and reading process, they are provided with an extensive, easily referenced and purpose driven channel of communication that nurtures the process. The purpose for submitting various stages of the process is not to mark and provide a grade on each stage and assess how well a student writes a rough draft or outlines an essay, it is rather to provide valuable feedback to propel the work forward. The assessment becomes a vital part of the learning process and a means rather than an end. Paul explains that through providing feedback at various stages of a student’s work, ‘it creates space for ideas to develop and provides drips of information, encouragement and direction to keep the students going and push the process forward.’ While rubrics are attached to different assignments, or stages of the process, they are always non-graded rubrics, whose purpose is to provide structured feedback and nurture the process rather than measure results. The final product of the process is a continuum of student development viewed across a collection of drafts and submission. Each piece of work has connected feedback and rubrics providing a holistic view of the student’s writing. 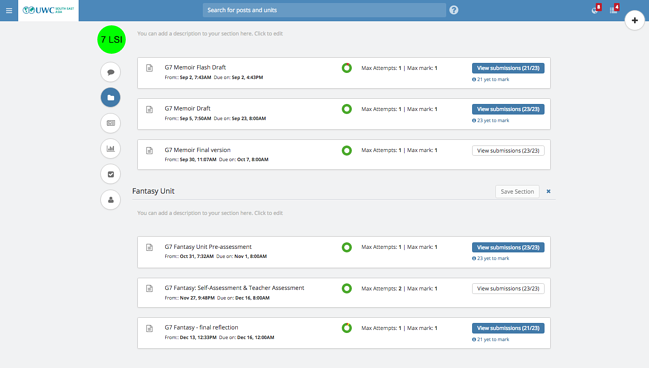 The application of the assignments feature in the English department’s system is two-fold. Firstly capturing the evolution of a piece of work in its different stages and having a record of that process. Secondly, capturing as much of the communication, reflection and considerations that act as the catalysts for choices and revisions in the writing and propels the work forward. By maximizing and extending the assignments feature functions, capabilities and integrations the English department’s method is able to capture many of these once lost moments of inspiration. The first submission in a piece will often be just a photo of the student’s notebook. With this artifact the teacher and student can look at ways to extend and structure their initial ideas. These conferencing sessions can take place in class or using the voice record and written comments bar of the assignments interface. 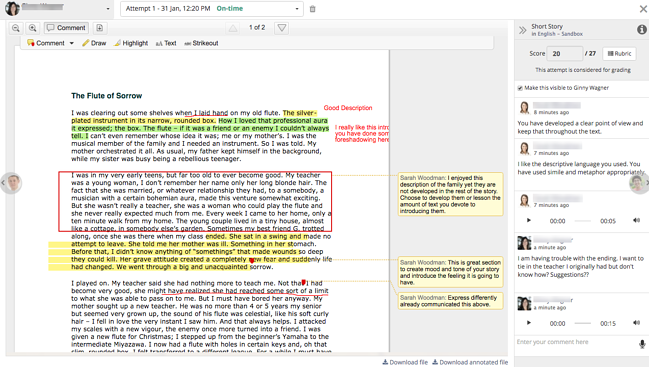 The students will then upload a piece of work from Google Docs and edit, self or peer edit and annotate with reflections and suggestions on the original draft. Subsequent drafts are submitted and the rubric is completed in collaborative conferencing sessions between student and teacher to further progress the writing to meet the standards and objectives of the task. These vital communications and considerations in the process are all saved on the OLP and can be revisited to look at how they influenced and evolved the final product. The choices made resulting in the final piece can be reflected upon, discussed and easily referenced, ultimately informing and improving future cycles. What has been created is a framework of communication which inevitably strengthens, reinforces itself, and yields better results through usage and time. The department’s approach effectively implements formative assessment strategies but also aims to support and enforce practices and processes of the Columbia University Teachers College Reading and Writing Project (TCRWP). 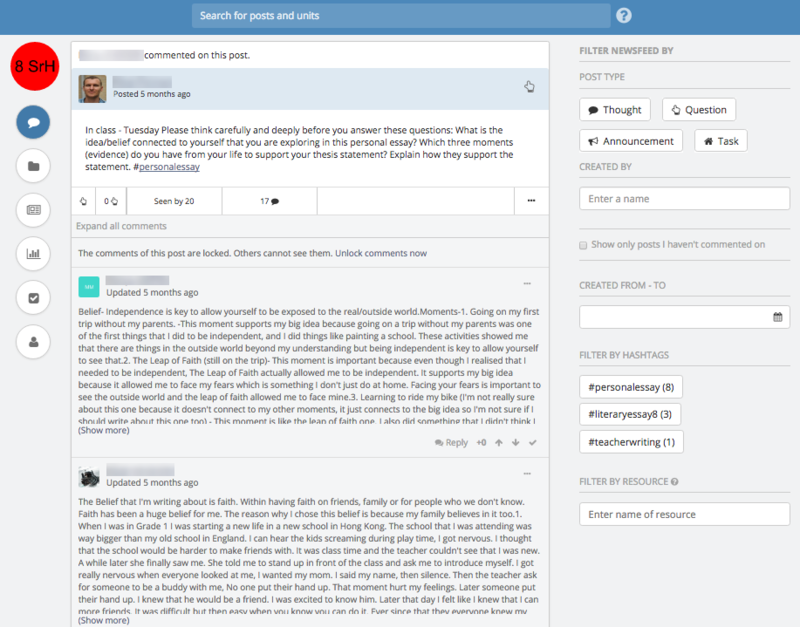 The use of a collaborative learning management system, like Teamie, employs both synchronous learning, instruction and collaboration in “real time” via the internet (i.e. live chat, audio and video conferencing, data and application sharing, shared whiteboard, joint viewing of multimedia presentations and online slide shows etc.) and asynchronous learning methods, time-delayed capabilities of the Internet (i.e. e-mail, threaded discussions, newsgroups and bulletin boards, file attachments etc.). Turner and his colleagues are creatively applying the Teamie platform and innovatively structuring its features so synchronous and asynchronous learning experiences maximize opportunities to create meaningful formative assessment experiences and effectively immerse the principles and practices of the TCRWP in the learning environment of Middle School English at UWCSEA. Turner put it well when he said ‘some of the best teaching happens over the student's shoulder’. I agree, but realistically when those sort of teaching opportunities are limited, innovative application of technologies is often the best substitute and a great way to create unlimited, ‘individualized over the shoulder teaching moments’ so important to learning. Want to learn more about how to enhance pedagogy in your school by using technology? Download the case study on UWCSEA, from the leading research firm Ovum, that highlights how UWCSEA have used technology to enable instructional strategies in their school.